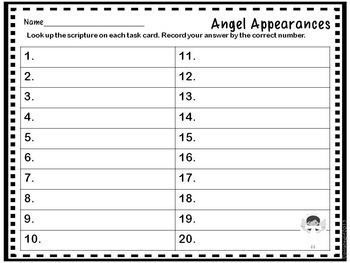 This is a set of 20 Biblical Task Cards that focus on angels (who they appeared to, places they showed up, why, etc.). 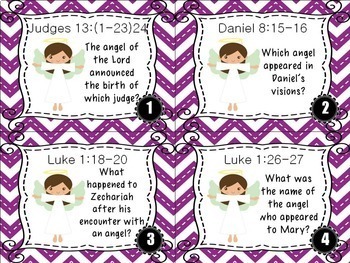 Each task card gives a reference to scripture for your students to look up and then record their answer. Pack includes choice of 3 different recording sheets (one is a shortened version in case you choose to use only half of the pack at a time). An answer key is also included. 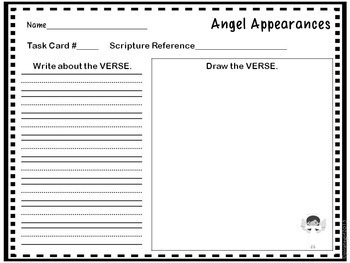 Great for small groups, literacy centers or as a whole group activity.